The South Korean Bar Association (KBA), a member body of lawyers, asked the government on Thursday November 8, during the news conference held at the Korean Parliament, to formulate an effective legal framework for digital currency and distributed ledger technology (DLT) industry. 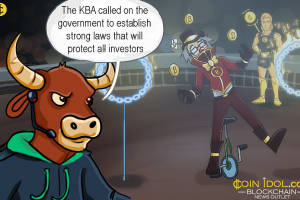 The KBA officially and publicly called on the government to establish strong but good laws that will protect all investors in the nascent industry and also motivate domestic DLT sector. It’s very uncommon for the KBA, membership of which is obligatory for all local lawyers within the country, to operate publicly for a certain business or technological interest teams. “We urge the government to break away from negative perceptions and hesitation, and draw up bills to help develop the blockchain industry and prevent side effects involving cryptocurrencies,” Hyun said at a news conference held at the parliament. The prudent lobbying move by KBA, emerges at the moment when the Korean government explicitly eliminated the domestic blockchain technology sector from the notably acknowledged list of certified venture companies in South Korea. While in the Parliamentary meeting last month, the chairman of South Korea’s FSC revealed that the regulator is standing still with its decision of declaring initial coin offerings illegal in the entire nation. However, the domestic digital currency trading in the country is by far one of the giant markets this world has and is also a home of bullish crypto exchanges such as Bithumb & Coinbit. Recently, Choi Jong-Ku, the Korea’s Financial Services Commission (FSC) commissioner, bolstered that digital currency exchanges agreeing with anti-money laundering (AML) and know-your-customer (KYC) norms won’t experience any problems in getting banking services in South Korea. According to reports from Reuters, Blockchain tech features networked “distributed ledger” databases which record down crypto transactions in a manner of securing virtual deposits from being tampered with, manipulated and fraud, despite many events of Bitcoin hacking being massively reported.